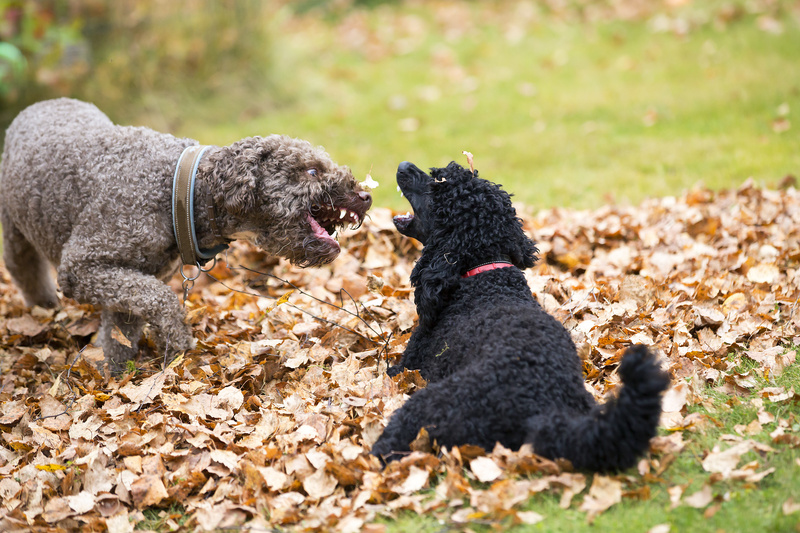 Aggression towards other dogs is arguably the most common form of aggression shown by our canine companions. 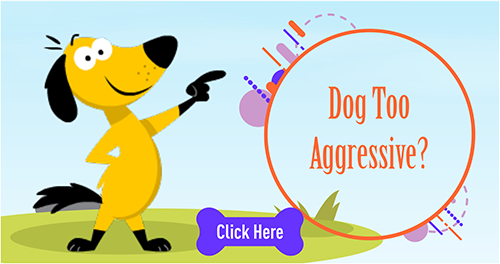 It’s not uncommon for a dog to get aggressive toward an unknown dog, or other dogs in the home, because a dog often feels the need to protect her territory. But, there is a limit as to how aggressive or protective a dog should be. 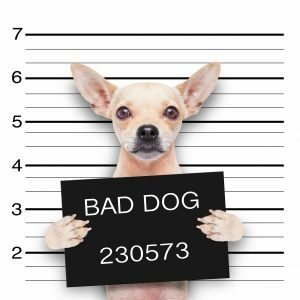 If your dog shows excessive aggressive behavior towards other dogs, then she is putting herself in a position where she could either suffer or inflict a potentially fatal injury, and this could ultimately result in a lawsuit or animal control taking your pet away. Not all dogs like the interaction and sociality of other dogs. Some simply are dominant and don’t want to share their space and their life “goodies” including their family and home, while others are defensive, scared or shy. I liken this to social anxiety disorder in people when people are almost phobic to be at a party or in a situation with large amounts of people. However, curing dog aggression toward other dogs is possible! Want To Learn How To Eradicate Nearly ALL Your Dog's Aggressive Behaviors? Enroll in our 8-week MASTER-CLASS on Emotional Re-calibration Training (ERT) specifically for Over-reactive, Fearful and Aggressive dogs. The problem is that most owners want their dogs to be social, and ignore the warning signs of dog aggression. 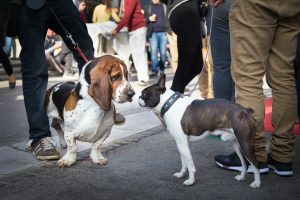 Although some dogs can be socialized and learn to appreciate the company of other dogs, in severe cases some dogs need to be taught how to control their feelings toward other dogs, while living as the only dog or pet in their environment. Dog On Dog Aggression is a Serious Problem! 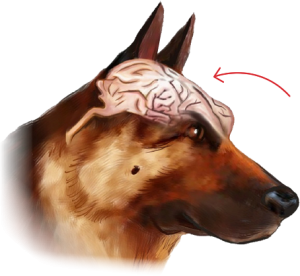 Some dogs are genetically preprogrammed to be dog aggressive; i.e. Greyhounds might view smaller faster running dogs as prey or the “bunnies” they were bred to hunt, and other breeds such as some of the larger terriers have been bred to fight other dogs, with plenty of natural aggressive behavior. Some dogs are even MORE aggressive ON LEASH than they would normally be off leash. If you are having questions about your dog and his behaviors, take them seriously, don’t discount them and walk blindly into a possible deadly situation! 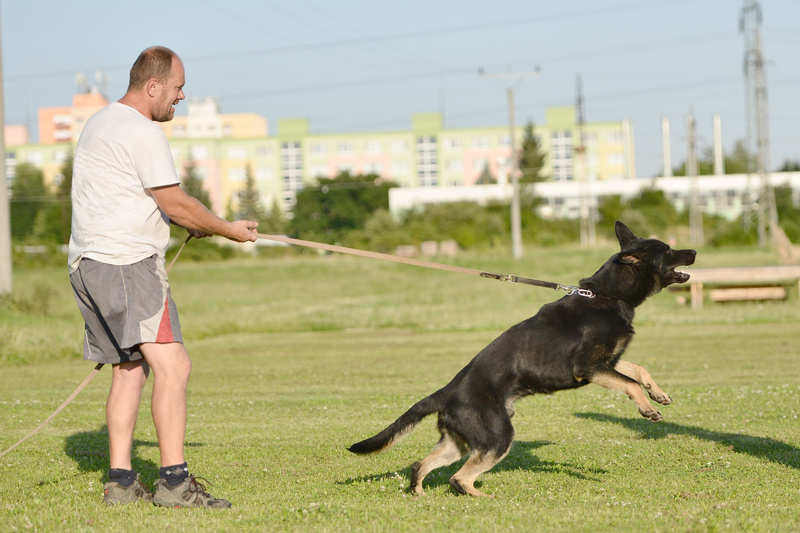 Safety for your dog and other dogs is the most important facet of dog on dog aggression training. 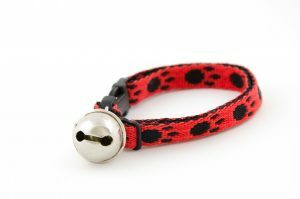 Next remember that aggression incites aggression, so adding punishment and pain to the situation via painful training collars, and scary tactics such as alpha rolling, will only make things worse for your dog. Some dogs with dog aggression issues suffer from displacement biting (biting their owners) while being forcefully corrected. 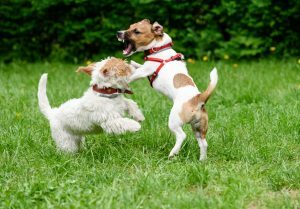 There are several factors that can cause a dog to be aggressive toward other dogs. For instance, the dog may have been neglected or abused in the past. Or, she may never have been socialized with other dogs when she was a puppy. In some cases, adult dogs that are rescued from dog fighting operations could have aggressive behavior toward other dogs, or she may have experienced a traumatic encounter with another dog in her youth. A painful medical condition could also account for the dog’s irritability. 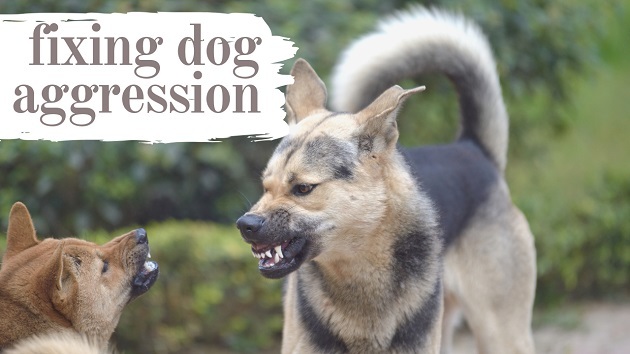 The most common symptoms of canine aggression include growling, biting or snapping, lip lifting, staring, and lunging towards another dog or puppy. 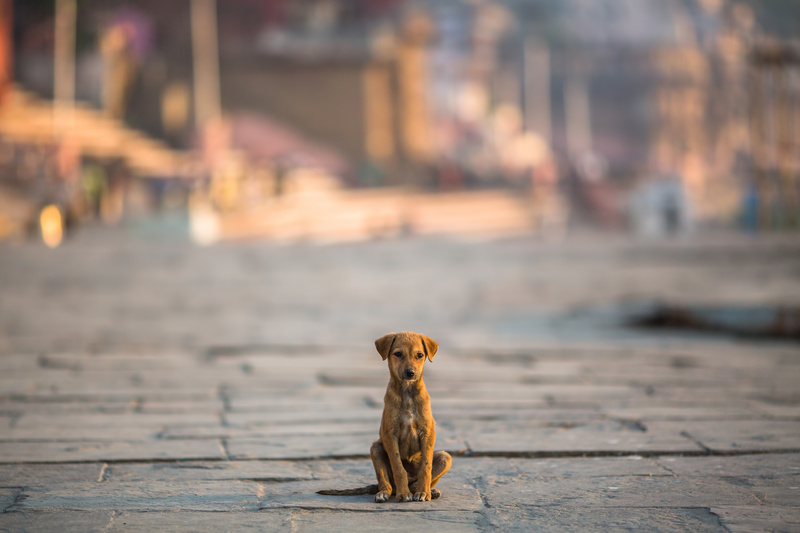 In some cases, an aggressive dog may exhibit fearful or submissive body postures and expressions such as crouching, tucking of the tail, and backing away. If your dog or puppy is starting to become over-aggressive, then you should take her to the veterinarian to rule out any potential medical causes. The vet will perform a variety of lab tests, including a biochemistry blood profile and urinalysis. 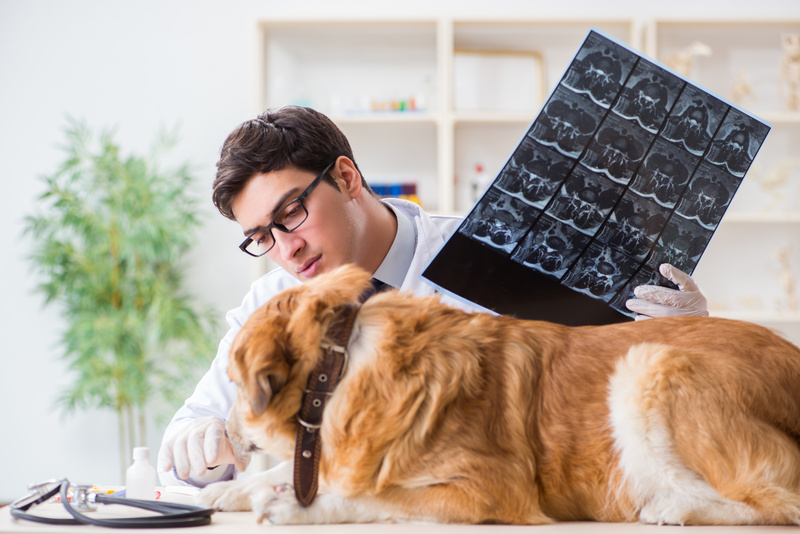 If these test results come back negative, then an MRI may be ordered to help determine if the dog has a central nervous system disease or any other neurological problems that could be attributing to her aggressive behavior. If MRI results come back negative, then a medical condition is not the cause of the aggression. In such a case, you will have to take your own steps to help reduce the risk of an attack. 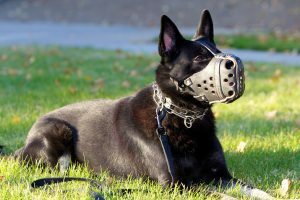 Such measures include avoiding risky situations or walking in areas where other dogs congregate, and training your dog to be comfortable wearing a muzzle. 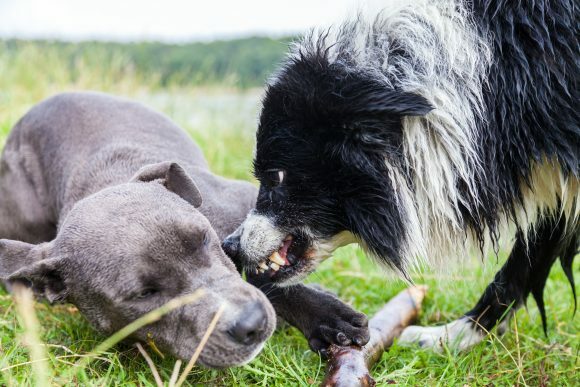 There currently isn’t a medicinal cure for dog-dog aggression, unless of course the aggression is being caused by an underlying health condition that can be treated. If the aggression is being caused by anxiety or fear, a veterinarian may prescribe an antidepressant, a benzodiazepine, or a serotonin uptake inhibitor to help keep the dog in a calmer state. First you must employ desensitization, trust, positive reinforcement and obedience training. Second, your dog must be desensitized to the visual stimulus and reaction brought on by seeing another dog. As you work together as a team, using positive reinforcement and rewarding your dog for appropriate behavior you will build a level of trust. Knowing how to work with your dog or puppy and giving him the appropriate behavioral cues will give him something else to focus on in the presence of other dogs and animals. It is important to keep your dog and other dogs safe at all times while you are working and to work at a speed your dog is comfortable with. For dog aggression issues, it is best to take a dog’s age, health, temperament, and preferences into account, while coming up with appropriate solutions. Be calm and do not put continuous tension on the leash. Dogs are very sensitive to what their human is feeling. My dog picks up on my emotions and reflects them, except with much more intensity. Sometimes, I am not even conscious of feeling nervous or stressed, but my dog notices it and starts to act up. Once I consciously calm myself down, his behavior also improves. When I see another dog, I usually just ignore him and move along. I have found that avoidance is most effective when I avert my eyes from both dog, as well as owner. I keep my eyes forward, and keep walking at a natural pace. In this way, my dog learns that when we see other dogs, we avoid rather than confront. Do not allow this bad behavior, do not let your dog or puppy practice it, do not even let him think about it. Just move him along, and ignore. If the other dog is somehow blocking us (e.g. if the owner is unable to control his dog), then walk away in a different direction. Do not stare the other dog down and do not confront him, either through posture or by physically engaging him. We can do this by moving across the road or into a driveway, and waiting for the other dog to pass. We may also move our dog or puppy behind a barrier, for example a car. If there are no barriers available, we can try blocking the dog’s view with our body. By doing this, we avoid a head-on, more confrontational passing. I have tried all of these blocking techniques, but what works best for me is to create space, and quickly move past the other dog. Whenever I wait for the other dog to pass, my Shiba uses that time to start obsessing. Dog treats and trying to get his attention do not work at this point, because the other dog is too close, and my dog is no longer listening. The advantage of walking my dog briskly past the other dog, is that he has less time to stare. In addition, he cannot fully obsess, because he must partly focus on walking. I try to set my dog up for success, and do not let him practice aggressive behaviors when meeting other dogs. The more he practices, the more aggressive he will be. If my dog becomes agitated during a walk, I try to end the outing as soon as possible. Once in this mode, his adrenaline levels will be high for a fair duration, and he will likely react aggressively to all the dogs that we meet. In this state, he will no longer be capable of learning, and will only be practicing dog aggressive behaviors. Being consistent with neutral or positive greetings will build our dog’s confidence. If people with weak energy stop and want to meet my dog, I ask them nicely to please move on, because my dog is easily excitable. It is fine and good to let a dog or puppy meet people with calm energy, but make sure to let them know how to best meet our dog. In particular, turn away when he jumps, no quick movements, and no petting from above. Some dogs, for example Spitz-type adult dogs, have a natural look that may appear dominant (ears up, hair out, tail up). This dominant look may instigate other dogs to respond in kind, and start posturing as well. Conflicts may occur, and if neither dog is willing to back down, this may lead to a dog fight. If I am unsure about a dog greeting, I just move on. Better to be safe than sorry. Be aware that your dog’s natural look may trigger a reaction. I take my dog a far distance away, far enough away that he is still calm and able to listen to me. Then, I get his attention by calling his name. If he looks at me, I praise, and treat him for behaving well. Sometimes, I also ask him to do very simple commands, e.g. Sit. I let my dog sit and watch the other dog as long as he is calm, and willing to give me his attention when I ask for it. Once we are both comfortable with this, I move one step toward the other dog and repeat the Focus and Sit exercises above. Do not move too close to the other dog, too quickly. If we move forward too fast, our dog may become reactive, and will no longer be able to give us his attention. At this point, I no-mark my dog (uh-oh) and move back a few steps. Once we are far enough away, I try to get his attention again. When he gives it to me, I stop, praise, and treat. I always try to make sessions short, fun, and rewarding. This helps our dog associate other dogs with being calm, and with positive experiences. I make sure to stop before my dog shows any obsessive behavior, and long before he becomes aggressive. Once a dog becomes reactive or shows aggressive behavior, it is usually best to end the session soon after. For desensitization to be successful, it is always important to keep our dog below his instinct threshold. This is when dogs within the same household become aggressive with one another. This type of aggression is more common in intact male dogs but can also be seen in intact female dogs and even neutered dogs. Typically before a severe inter-dog incident occurs there are subtle warning signs; staring, growling, snarling or simply just blocking access to doors or other resources. This behavior is often considered normal but scuffles and antagonistic behaviors among family dogs is not normal and needs to be carefully dealt with. Treating dogs with inter-dog aggression requires acknowledging there is a problem and being willing to make some changes. Caught early enough and with the use of positive reinforcement the aggressor can be taught through behavior modification to allow the other dog or puppy to exist in the home. The victim must always be protected, and something as simple as putting a bell on the aggressor can let the victim know where he is at all times. 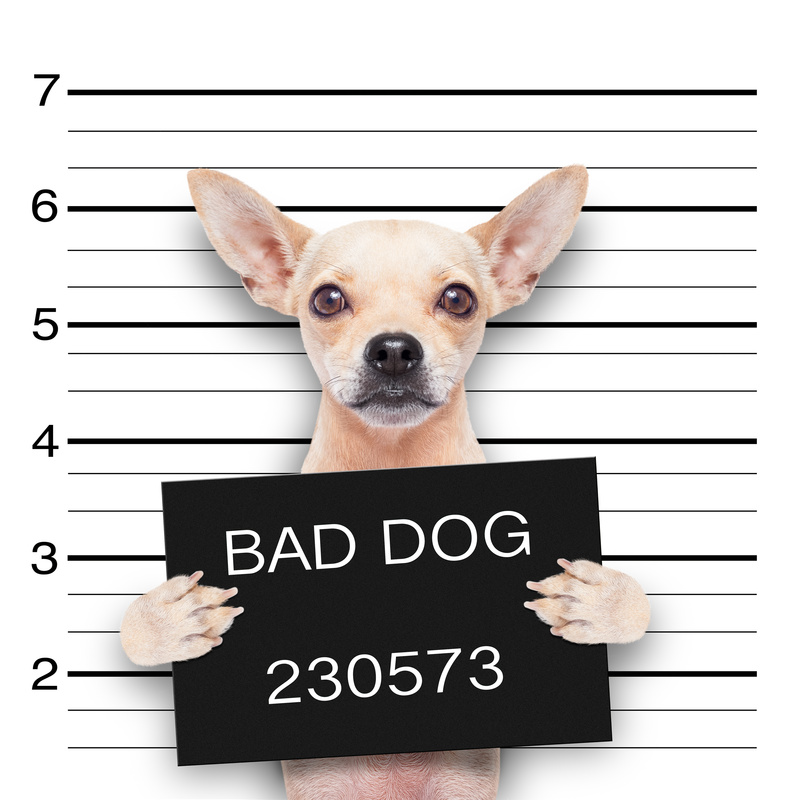 Predictability lessens aggression, and dogs should be supervised at all times. With behavior modification and positive reinforcement training, even dog aggression towards other dogs can be treated successfully, it may be difficult and it may be a slow process, but it is possible! Aggression within the pack can happen under nearly any circumstance. When the pack leader isn’t present, there is the possibility to be some disorder within the pack. The dogs could have some dysfunction within the pack, depending upon the situation in which they live and you lead their pack. If your dogs are peaceful with you around, but fight when you’re gone, it is likely out of respect for you as the pack leader. However, there can still be some contention and power struggles for determining the pack’s pecking order when you are not around. There are two main concerns I have noted as big causes during my 25 year career as a dog trainer. Yes, it is true… you can actually be the CAUSE of your dog’s dog aggression. The first way you can cause this is a total lack of socialization and exposure while the dog was a puppy. Puppies need socialization and exposure. If you take your puppy home and lock him in the house for a year, chances are he will not know how to act and react when he sees another dog. Social skills are built early. Imagine locking up your child and not letting them out of the house until they are about 12. They have literally never seen another child. Chances are this child would never be able to have “normal” relationships. You see, we learn social interaction from one another, and if we don’t have it when we are young, we don’t understand it. Dogs are the same. 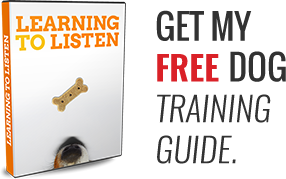 You cannot teach your dog how to communicate and socialize with other dogs, and neither can your dog trainer; this has to be learned through interaction with other dogs! Please safely socialize your puppies. Owners often, inadvertently, create leash reactivity. 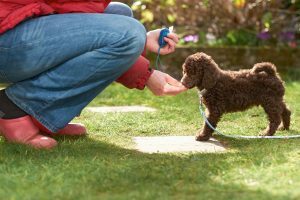 The problem starts when owners don’t begin by teaching their dogs “leash manners.” For your dog to not pull on the leash, he must be given those skills and taught how to walk nicely. But, instead, people slap a leash on their dog and take him out for a walk. When the dog sees another dog, he begins to pull. The owner pops the leash, corrects, yells, and gets frustrated (this is the beginning of teaching the dog to be aggressive). The dog doesn’t understand why the owner is acting like this (he just wants to see and play with the other dog), but instead he is feeling pain, and sensing frustration and anger from his owner. 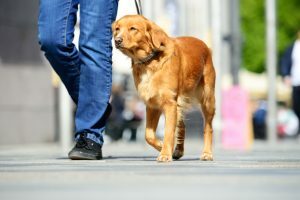 The next time a dog comes into view, the owner pulls his leash tight and he goes through the same yelling and popping routine and the frantic, fearful feeling from his owner. 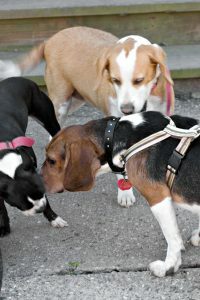 The dog, being a smart mammal, associates pain, frustration, fear, and owner frustration with the sight of another dog. But he is a problem solver, and decides if he shows an aggressive behavior display, he can keep that scary other dog away from himself and his owner. The dog lunges, and barks, and acts defensively. The other dog owner promptly turns and takes his dog in the other direction; effectively teaching the first dog that aggression will keep other dogs away. In essence, the first dog has learned, with the help of his owner, that other dogs are bad and that aggression will keep them away. This dog also feels he is in charge of the situation, and it is his responsibility to keep you both safe. It is sad because if this dog had just been taught how to walk on a leash without pulling and with distractions, this never would have happened! Some dogs are just dog aggressive and naturally exhibit aggressive behavior. Interestingly, my current adult dog (a five-year-old Malinois) has NEVER liked other dogs. Even at six months, he had to be separated and monitored with my animals. Some dogs just have aggression issues, and it has nothing to do with their owners, it can be genetic. The problem comes when these dog owners ignore it or rationalize it. I will be honest with anyone. My dog doesn’t “like” other dogs. In someone else’s hands, he would most likely be exhibiting severe dog aggressive behavior. However, I have the training knowledge and skill to keep his focus on me so that he can completely ignore other dogs. But many people write aggression off. Just last week, in the veterinary clinic where I work, there was a 30-pound dog barking, snapping, and lunging at two other dogs in the waiting area. The owner was discussing how sweet her dog was, and how he loved other dogs. Now, this may have some validity in normal life, but I can assure you this was not true at this moment. The dog would have gladly bitten either dog. He won’t trust you as an owner if you force him to do something that makes him uncomfortable. And, you are leaving him with two options: Either to get over it, or to use his teeth to get his feelings across. It really isn’t the best idea to force an animal, whose language you don’t speak, to do something that makes it very uncomfortable. And, it is unfair! 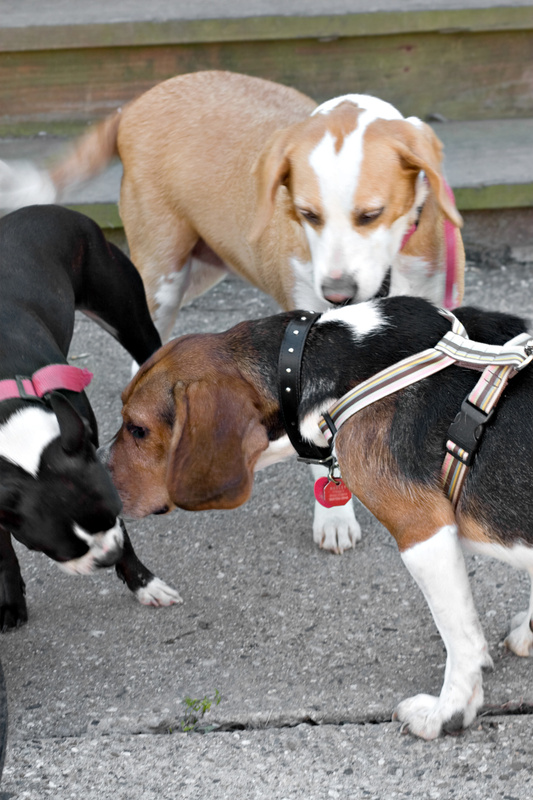 Teach your dog to “socialize” by focusing on you! If your dog is paying attention to you, and he knows you won’t FORCE him to socialize, you both win! He has a coping mechanism, focus on you, and you have a dog with good behavior. 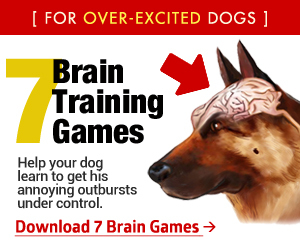 To help you do that, here’s a GREAT game to try, that starts to teach your dog how to stop looking at other dog’s, and turn his focus back on you. For more games on fixing dog aggression, check out our ERT (Emotional Reconditioning Training) program for dogs.